Since taking the class to learn the copper foil technique for making stained glass, and making my ladyslipper window, I was excited to try this technique on my own and make another window. Since this technique allows for a more detailed and realistic representation than the other technique I have used before (lead came), I thought it would be fun to make another flower to go with the ladyslipper - plus, I have a total soft spot for wildflowers and loved the idea of having a pair of wildflower windows. 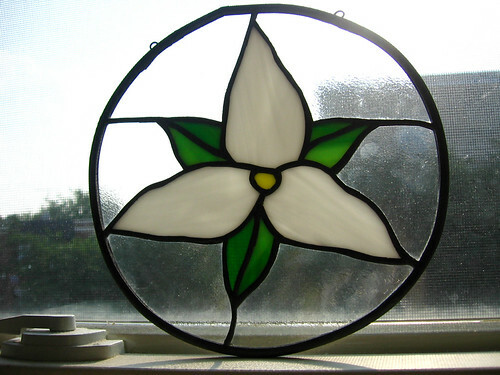 After making the ladyslipper, I immediately thought that a trillium would be a good subject for a second window, since they grow in similar habitats (eastern forests) and both flower in the spring. 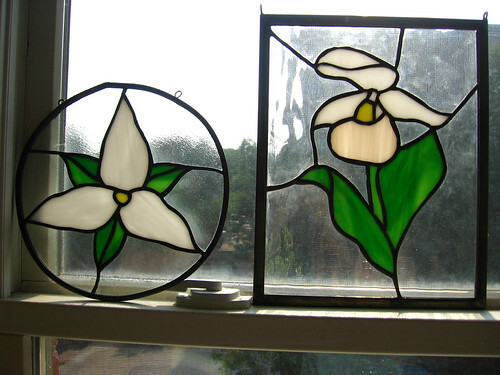 I drew the pattern myself, with inspiration from several sources, including this beautiful window, and these patterns. I love having this pair of cheerful wildflowers in the window in our study/my sewing room to look at while I work on my projects! I am excited to make more windows - I would love to make a quilt-block inspired one, and possibly more wildflowers. Plus I have a number of gift ideas. I'm hoping the weather cools down next week as predicted since I do my stained glass outside and it was ridiculously hot when I was working on this earlier this week (and has since gotten hotter)! How clever are you? They are beautiful! Love the beautiful stained glass. Especially the Trillium. It's the official flower of Ontario!! Another Knit Skirt - with Pockets! Announcing the Bloggers' Dinner Party!